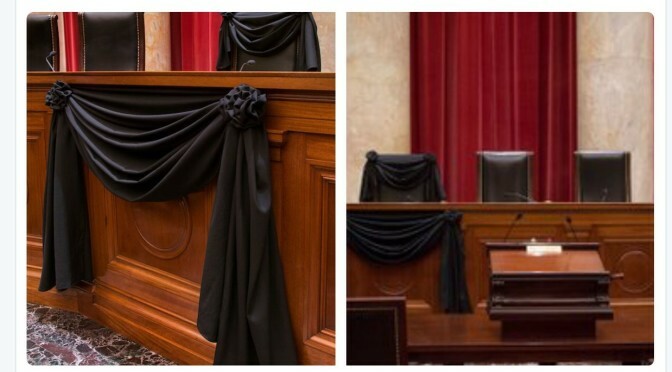 I’m sorry that the crucial importance of Justice Scalia’s now-vacant seat on the Supreme Court meant that the heated battle over filling it was already well underway while most of us, reeling from the profound loss, craved a respectable interval to console his loved ones and reflect on his epic legacy. Yet when I groused to a friend about the unseemliness of it all early Saturday evening, I was gently admonished with this thought: Antonin Scalia loved America, lived to preserve what was great about America, accomplished more in that regard than almost anyone in our history, and would have hoped that we’d follow that example—not just honor his legacy but act on it. Thus, a few thoughts about the nomination battle that should not happen. Of course President Obama is going to propose a nominee. It is a legitimate exercise of his authority to do so. But it is also a legitimate exercise of the Senate’s authority not to entertain the nomination. That is clear from the Constitution’s plain language and attested to by the history of Democratic obstruction of judicial nominees by senators named Obama, Clinton, Schumer, Leahy, et al. The presumption that a president is entitled to his nominees if they satisfy basic criteria of competence and probity applies to executive-branch officers, not judges. Officers of the executive branch exercise the president’s power and are removable at the president’s pleasure, so naturally the president is entitled to deference in this area—although (a) not if the nominee has a history of misconduct (see Eric Holder), (b) not if he nominates someone who says she will support executive-branch lawlessness (see Loretta Lynch), and (c) there cannot be unilateral surrender—if Democrats reject executive nominees for philosophical reasons, Republicans would be foolish not to respond in kind. Judicial nominations are a different matter entirely. Even in traditional, pre-Bork times, the courts were a discrete branch of government. Judges get lifetime appointments that stretch well beyond the presidency in which they are nominated, and far from wielding the president’s power, they are often a check on the president’s abuse of that power. So clearly, even before 1987, the president would not be entitled to the kind of deference that he deserves on executive appointments. With the Bork nomination fight, however, Democrats politicized the judicial-appointments process and the courts themselves. It would thus be ridiculous to give the president deference by rationalizing—as many Republicans have in the past—that we are really just evaluating a lawyer who will be expected to apply the law without fear or favor; and therefore, we should err on the side of approving any nominee, regardless of ideology, who is competent and of good character. No, we are not evaluating a lawyer; we are deciding whether Democrats get another vote on a nine-member super-legislature. The justices chosen by President Obama and the Democrats may be very good lawyers, but they have been selected because they will be reliable votes in favor of left-wing outcomes. That is politics, not law. And don’t tell me both sides do it. The justices favored by the conservative legal community that advises Republicans are those committed to faithful adherence to constitutional limits on the judiciary. We may be pro-life, but (by and large) we are not looking for a justice to invent a constitutional prohibition on abortion; we are looking for a justice who says the Constitution does not speak to abortion—it leaves the issue to be resolved by the people, through their representatives. We are looking for justices who respect the Constitution as a framework that promotes popular self-determination with certain well-known minority-rights exceptions, and who do not see litigation as an opportunity to impose a political agenda. Yes, we are looking to be protected from being dictated to by the Left under the guise of a “living Constitution”; but we are not asking to dictate our competing policy preferences—just to have a shot at persuading our fellow citizens of their merit through the democratic process. Since Democrats have turned the Supreme Court into a political institution, and we want it to be a legal institution, why should we pretend to entertain President Obama’s nominee? If he blows us away by choosing someone in the Scalia mode, we can deal with it when and if the time comes (which it won’t). Otherwise, let’s be real: The president will not endeavor to improve the quality of legal acumen on the bench; he is looking for someone who will vote the “right” way (meaning, the left way) on restrictions on guns, abortion, speech, campaign spending, work, and property rights; on “climate change;” on the primacy of international agreements over constitutional rights and limits; on the rights of aliens and criminals; on redistribution of wealth; etc. Since we agree with neither these political positions nor the overarching politicization of the courts at the expense of popular sovereignty, why on earth would we enable the president to stack the court with another vote? Particularly when nothing in the Constitution requires it—just as nothing in the Constitution says there must be nine members of the Supreme Court? Republicans are in a position of strength. Obama must come to them; they need not do anything. More than half the country disapproves of Obama’s governance, yet his goal here is to put an ideological fellow traveler on the court who would perpetuate his governance after he is gone. Why would Republicans ever agree to that? We will have an election in November. Even before Justice Scalia’s tragic passing, it was clear that the direction of the Supreme Court and the federal judiciary was going to be a crucial issue. A vacancy on the Supreme Court only sharpens it, paving the way for the Republican nominee to make the case to voters that the GOP will find judges who will respect the right of the people to govern themselves, while the Democratic nominee will use the courts as an instrument to impose the Left’s unpopular policy preferences. So there is a very simple position for Republicans to take: The next Supreme Court justice can be chosen by the public or chosen by Barack Obama. We think the public should do the choosing in November.